November 1-7 is Carbon Monoxide Awareness Week in parts of Canada! Canadians - Check out NFPA's Carbon Monoxide toolkit and download resources that you can use in your community to promote Carbon Monoxide awareness. In the home, heating and cooking equipment that burn fuel can be sources of carbon monoxide (CO). Use free resources from NFPA and the U.S. Consumer Product Safety Commission to conduct a CO alarm awareness campaign in your community. Source: NFPA's Fire Protection Handbook, 20th Edition. 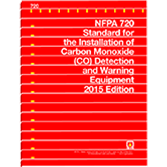 NFPA 720 improves safety for the public and emergency responders with rules that help ensure CO equipment reliability. 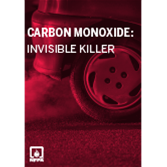 Show NFPA®'s Carbon Monoxide: Invisible Killer Video in your community and help people protect against a deadly hazard! NFPA's Ben Evarts explains why carbon monoxide is dangerous and talks about fire department response to CO incidents.